Browse here for tips and resources that help you get the most out of your insurance and protect what’s important in your life. People think it can never happen to them. But when you’re shopping online or in the store, you’re at risk for identity theft. In fact, every two seconds a new person in the United States falls victim to identity theft.1 This means an adult’s odds of being victimized are just one in 20. Be aware. During the hustle and bustle of the holidays remain aware of your surroundings and your belongings. About 43% of identity theft cases involve a lost or stolen wallet, checkbook, computer or phone. Never leave your purse, wallet, laptop or smart phone unattended while in a public place. If you’re staying in the hotel, you should assume that other people have access to your hotel room. Keep your valuables and personal information locked inside your hotel room’s safe. If you’re traveling, only take a few credit cards with you and call the credit card companies to tell them where you’re traveling, when you’ll be there and how they can get ahold of you if they notice suspicious charges. Limit access. Do not use your debit card to purchase holiday gifts. Debit cards are more risky because you’re using your own money and providing direct access into your checking account. Consider using gift cards or single-use credit cards to pay for all of your holiday purchases. Another great option is pre-paid credit cards or virtual credit cards. Some banks offer virtual credit cards that are good for only one transaction. If you still choose to use a credit or debit card this holiday season, check the activity on your card at least once a day for anything suspicious. Secure your connection. If you plan to shop for a few gifts while waiting for a friend at a coffee shop or before boarding your plane at the airport, make sure you’re using secure Wi-Fi instead of public wireless access. Before you use your mobile phone for online shopping, be sure to have a password lock on your phone and update it with the latest security software and manufacturer updates. It’s also smart to back up your phone often. If someone gets ahold of your phone and there are too many failed attempts to unlock it, all of your information on the phone will be wiped. Go direct. You might receive emails that display amazing deals at websites of stores you typically shop at, but don’t click on the link in the email. Instead, go directly to the store’s website. Identity thieves may create clones of store websites and use an email to bring unaware online shoppers to the fake site so they can steal personal information if the person buys anything. Also, be cautious of less popular or unfamiliar online shopping sites that have deals that seem way too good to be true. It’s possible these are scam sites, too. Guard your information. If you’re using your personal computer for holiday shopping, use firewalls, antivirus and anti-spyware. Keep your computer up to date with the latest security updates, encrypt emails and computer files that contain personal or account information and always use strong passwords. A strong password contains numbers, symbols and characters. Never use easy to guess passwords like your date of birth, your child’s or pet’s name or your mother’s maiden name. Get into the routine of changing your passwords often, and do not use the same passwords for online banking as you use for online shopping and social media accounts. Shred it. This is a good habit to form during the holidays and then practice year-round to avoid identity theft. Shred everything with your name and address on it, and especially anything with your social security number and bank information, before throwing it in the trash. This includes receipts, return address stickers, envelopes and catalogs. Even more important, be sure to shred pre-approved credit offers, credit card checks and insurance-related materials to keep your personal information out of potentially dangerous hands. 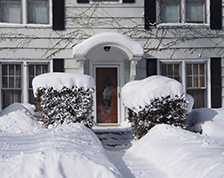 From preventing ice dams and frozen pipes to maintaining sidewalks and chimneys, these tips can help you begin to prepare your home for the cold months ahead.